Lou Williams is averaging 3.6 assists per game this seasons, the same as last year, despite a reduction in playing time. ATLANTA — Coming off a season in which he underwent major knee surgery, Hawks guard Lou Williams might not be scoring the way that he would like, but he is finding other ways to contribute. When starting point guard Jeff Teague went down last Friday with an ankle sprain that would keep him out for the next two games, coach Mike Budenholzer said he was comforted because of the play of reserve Shelvin Mack and also the way that Williams had been distributing the ball. 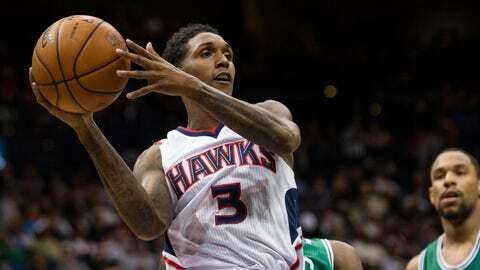 "Lou’s assists, he’s really distributing and passing the ball well," Budenholzer said. Since signing with the Hawks as a free agent in the summer of 2012, Williams had mainly been assigned and played the role of a scorer off the bench, even though at 6-foot-1, 175 pounds, he is somewhat undersized to play shooting guard. Last year before suffering his season-ending injury, Williams played that role ably, averaging 14.1 points in 28.7 minutes per game in 39 games. This season, Williams’ scoring average has fallen by 4.5 points per game and his minutes are down, too, to 23.5 per game, but that is partly because when he initially returned the coaching staff was being cautious with him. Even with those reduced playing time, Williams is still averaging 3.6 assists per game, the same as he did last season, despite that 18 percent reduction in minutes. "I think Lou’s play-making and just pick-and-roll and reading and seeing the floor and, really, I think it’s been (good) for a while," Budenholzer said. "I think he’s just gotten a little more opportunity with Jeff injured but even all year, he’s got a real knack for hitting the open guy and he’s got a unique pace and style. "I think that hopefully he’s going to continue to get better and better." Last Friday against San Antonio, the game in which Teague went down, Williams finished with seven assists. He added five more in a win over Milwaukee the next night. He has averaged 5.2 over his last five games. Still, Williams is not pleased the way he has played. "For my standards, it hasn’t been very good," he said. "It’s been a learning experience for me, just learning how to play with an injury and taking 10 months off and trying to get a rhythm back. But we’re at that halfway point where I feel like I’m turning that corner health-wise. I think my health is getting better and better. My play should, as well." Budenholzer, in his first year as the Hawks’ coach, explained Williams’ thinking by citing the player’s competitive nature. "I think he probably feels like he has more to give," Budenholzer said. "I think that he’s working hard and if he’s got more, we’ll take it. I’m pretty happy with what he’s done. I wasn’t here last year or in the past and I’ve just been an opposing coach and it’s a whole different thing to have a person every day and be around them every day so I can’t really compare what he was before to now." Despite Williams’ size and reputation as a scorer, he does possess versatility. "Louie’s always going to step up and play well," said Teague, who practiced on Thursday but remains day-to-day with a sprained ankle. "He’s a good player. He can play any position on the floor, he just goes out there — he’s a basketball player. I don’t think he has a position so when he goes out there, he plays well, he plays hard and he’s going to play to win." Williams said that filling in at times for Teague has been "business as usual" for him. "Whatever’s needed," he said. "I’m thankful I had pros to learn from when I was a young guy in this league and whenever my number’s called, you step in. You play whether you start or whether you come off the bench. You just be effective whenever you come in the game." Those pros that Williams recalled learning from played on the Philadelphia 76ers, the organization with which he spent his first seven seasons. He was looking forward to playing in Philadelphia on Friday. It is just the second time he has played there since signing with the Hawks. He said his first time playing in Philadelphia, he was pleased by the warm welcome he received prior to the game’s start. However, after the opening tip, the boos reigned. He said that’s typical for the city and its die-hard fans. "I started my career there," said Williams, an Atlanta native. "They gave me my first opportunity. Had my first child there, basically grew up there. Got there when I was a 17-, 18-year-old kid, left when I was 25 and created a lot of friendships, a lot of memories and a lot of friends that I have there still that I don’t have an opportunity to see so still fun to go there." And maybe they’ll see him turn the corner a little more on his road to recovery.